Amazon, formed 25 years ago, has eclipsed Microsoft to become the world’s most valuable listed company. The online giant was worth $797bn (£634bn) when the US stock market closed on Monday after rising 3.4% and moved past Microsoft, valued at $789bn. 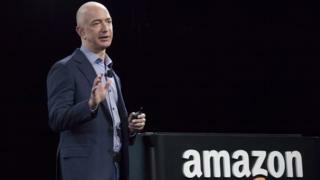 Jeff Bezos, the founder of Amazon, is the world’s wealthiest man, with riches of $135bn, according to Bloomberg’s billionaire index. It was originally called “Cadabra,” (as in “abracadabra”) and in 1995 sold its first book – Fluid Concepts and Creative Analogies: Computer Models of the Fundamental Mechanisms of Thought, by Douglas Hofstadter. The business was floated on the stock exchange in 1997, raising $54m. As a result, Mr Bezos joined the ranks of the world’s richest business people before he turned 35 years of age. In 2017, it paid $13.7bn for Whole Foods Market, which brought it a large network of physical stores for the first time. In addition, it has won the rights to broadcast live sporting action, such as football from England’s Premier League and ATP tennis. Major technology stocks have been volatile in recent months. In August, Apple became the world’s first public company to be worth $1tn (£767bn), while Amazon achieved that valuation in September. Since then, Apple’s fortunes on the stock market have waned after it warned about a slowdown in China. The tech giant is now valued at $702bn.